We are conveniently located at the bottom end of Park Street, just beyond the pedestrianised zone - opposite Laura Ashley and Pure Gym. The salon is now in its 14th year of trading. 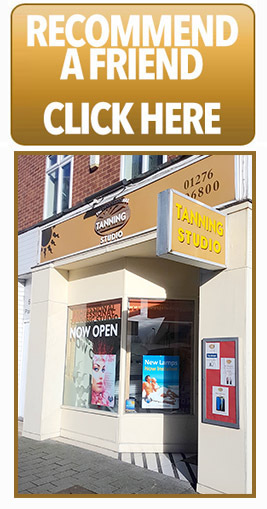 We recently refurbished throughout and took the opportunity to upgrade some of our sunbeds. We have the largest retail selection of accerator lotions, SPFs, teeth whitening products and slimming pills. Our pay-as-you-go prices are very competitive, but if you want further value we have a range of money saving courses and monthly special offers. 'Like us' on Facebook to be kept up to date with our deals.